To make up for its dwindling supply of nuclear power, Japan is on a frenzied but costly hunt for fossil fuels. As part of that hunt, tankers from as many as 12 countries are pulling up weekly to Japanese port cities, hauling liquefied natural gas supercooled to 162 degrees below zero. Officials from Tokyo are making trips to the Middle East, requesting increased shipments of oil. In the Timor Sea, off the coast of Australia, a Japanese firm has invested in a subsea natural gas pipeline that will eventually speed deliveries northward. 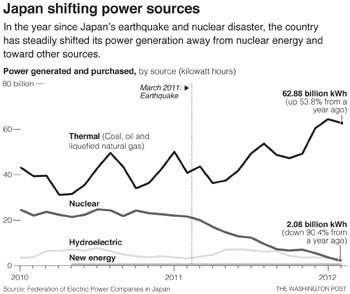 So far, Japan’s drastic increase in fossil fuel imports, namely oil and liquefied natural gas, has kept the country from the short-term crisis of power outages and darkened cities, even as more of its nuclear plants go offline. But the import surge also comes with a dire side effect, analysts say, that strikes at the heart of the world’s third-largest economy. By relying on pricey, imported alternatives to nuclear energy, Japan this year is facing an ominous cycle in which energy costs rise and business conditions erode. Even if thermal plants operate at full capacity this summer, the country will still be short on electrical power in peak months, hampering industrial production. That means industrial exports could shrink at the same time energy imports are on the rise, shriveling growth rates and leaving the country more vulnerable to global price shocks. There is a solution to all this — restarting the nuclear power plants — but given Japan’s mounting objection to atomic energy, it draws only a dark laugh. Even before last year’s nuclear crisis, a triple meltdown triggered by an earthquake and tsunami, Tokyo ranked as the world’s largest importer of LNG and third-largest importer of crude oil. But nuclear reactors powered one-third of the country’s needs, and the country planned for that share to increase to 50 percent. Thirteen months later, only one of the nation’s 54 reactors is operating; some were shuttered because of the disaster, and most of the others have gone offline for scheduled maintenance. Despite attempts by politicians in Tokyo to persuade them to do so, prefectural governors and local communities won’t allow them to restart. In February, nuclear plants produced just 3 percent of the total power generated in Japan. By next month, when the sole remaining reactor, in Hokkaido, is to shut down, Japan will be nuclear-free just as temperatures begin to climb. In recent months, to fill the void, Japan’s imports of LNG, crude oil and heavy fuel oil have risen by 15 to 30 percent, compared with comparable periods before the disaster. A recent Deutsche Bank report calculated that Japan’s power generation costs in February were $1.9 billion higher than during a typical month in which nuclear plants were in operation. Analysts say Japan has always been willing to pay a premium for secure and stable supplies of energy — particularly LNG, which is cheaper and more carbon-friendly than oil. “Japan is seen as the golden market,” said Ken Koyama, a chief economist at the Institute of Energy Economics. Though Japan receives most of its LNG from the Asia-Pacific, particularly from Australia and Malaysia, LNG prices are typically tied to those of crude oil. So when instability roils Syria or Sudan, Japan pays more for both of its preferred fossil fuels, not just one of them. Any crisis in the Strait of Hormuz, which Iran has threatened to block, would pose immediate problems for Tokyo. About 90 percent of Japan’s oil comes from the Middle East, most of it passing through the strait. Experts in Tokyo say Japan’s economy is now at the mercy of its energy supply. A recent forecast from Japan’s Institute of Energy Economics, a government research body, laid out two scenarios — one in which reactors gradually come back online beginning this summer, and one in which they don’t. With some of its reactors running, Japan’s gross domestic product in 2012 would grow 1.9 percent, according to the first scenario. Industrial production would rise 5 percent from the previous year, and the country would have a trade surplus — its standard for three decades, before a deficit in 2011. Without its reactors running, though, Japan’s GDP would grow just 0.1 percent. The country would be 12 percent short on electricity during the hottest months, forcing a reduction in factory production and further encouraging corporations to relocate overseas. Just as important, the country would log another trade deficit — projected at $57 billion. Much of this would be directly attributable to fossil fuel imports, which would account for about $21.1 trillion, or 30 percent of Japan’s total imports, according to the report. For perspective, if Japan managed to import just $16.4 trillion in fossil fuels — its number in 2010 — the trade deficit would all but disappear. By midsummer, Japan plans to announce a new long-term strategy — an outline for the “best energy mix” among nuclear power, fossil fuels and renewable sources. Few energy executives expect that nuclear power will account for the 50 percent that the government once suggested. So Japanese companies are already paying for imports to fill an expected void in next decades. One such project was finalized in January, when a Japanese energy company, Inpex, teamed up with a French company, Total SA, and signed off on a deal to export gas from a remote spot in the Timor Sea, hundreds of kilometers off the northern tip of Australia. That gas, officials involved with the deal said, will be pulled from the depths, pumped through a subsea pipeline to Darwin, Australia, then cooled to liquid form, shrinking to one-six-hundredth of its original volume. Beginning five years from now, as part of a $34 billion deal, Japanese companies — including Tokyo Electric Power, operators of the Fukushima nuclear plant — will receive more than 6 million tons of that gas annually, about the total the country now consumes in a month.